There are some people who pride themselves on cultivating a mammoth Facebook friend list, and then there is you…the fiercely loyal pal, who’d rather have five amazing comrades, then hundreds of meaningless acquaintances. But you’re steadfast about everything, unequivocally committed to the things that really count, and letting the rest roll right off your shoulders with no regrets. And with jewelry, you’re the exact same way, opting for special pieces, instead of dabbling with passels of frivolous throwaways. Silversmith Teresa Kahres veered towards enameling to widen her color palette, enabling her to dance more deeply with her botanical and oceanic inspirations. Ruffled flower earrings, dotted with pearls, are streaked with rich hues, as are lengthy crumbled leaves forming an asymmetrical necklace centerpiece. 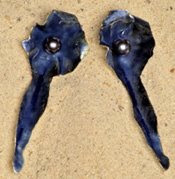 Enamel shells, glistening white and cupping grey pearls, are a perfect winter resort adornment. For the fall season, we covet the flower drop earrings (above), drenched with blue tones and dressed up with gothic pearls. To view styles and purchase, visit the designer’s Web site. Most of us say one thing, but really mean another, but that's just because we all tightly scrutinize things through our own personal microscope. Which explains why some see beauty in small imperfections, and others cite them as unequivocal flaws. But perhaps everything is a dual-sided entity, with interpretation not determined by which side the wind is kicking, but on the threshold of forgiveness in our hearts, and how far our minds will let curiosity wander. Take for instance the reticulation of brass, a melting process that elevates the copper, imprinting the metal with intervals. What was once smooth is now imperfectly rippled, yet far more complex. This texture evolution is the blueprint for Alicia Goodwin’s jewelry line Lingua Nigra. 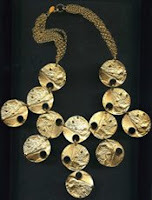 Some circular elements are heavily manipulated to reveal repetitive patterns (disc necklace above), while others are given a lighter hand to encourage free-form results, such as a drop pendant earring with a curved end resembling a worn book page corner. To view styles and purchase, visit the designer’s Web site, which currently forwards to her Etsy shop. Yes, a soft-spoken demeanor often does belie a tough-as-nails interior, but it's not as if being disingenuous is on the agenda. Some people just subscribe to the belief that if you want to rule the world, an iron fist in a velvet glove is a more palatable approach. Determination after all, doesn't come in just one aggressive flavor. Designer Danielle Pittman has an appreciation for nice girls that say please and thank you, but insightfully recognizes that it doesn't mean they are relinquishing anything, not even close. Her pieces are simultaneously tough and pretty, influenced by nature's sturdier creations, such as pinecones, hickory, and sand dollars. Even delicate petals are translated into robust forms, appearing hearty and twisted. 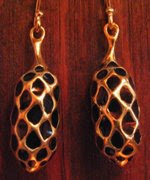 The honeycomb selections, necklace pendants and earrings mingling enamel with gold, are stalwart pieces, worthy of attention. To browse styles, visit the designer's Web site. To purchase, shop Bird in Brooklyn. The thing about die-hard New Yorkers is that only a handful were actually born and raised here. But home is where you feel most comfortable in your own skin, regardless of whether it was adopted deliberately or arrived at inadvertently, and solidifies a sense of belonging that no other relationship can ever adequately equal. And New York City does indeed cast a spell on people, with its unmistakable fullness, lifting energy, and historical prominence. BYLU designers Ken Leung and Dana Chin understand the joy of discovering a place that beckons your heart and stirs your soul. Heralding from Maine (Dana) and Hong Kong (Ken), both now embrace New York City as home, and their Compass Rose collection plays homage to the complex labyrinth of its city streets, as well as the calm botanical oasis at its center. Mixed metal pieces are imprinted with vintage city street maps, from round necklace medallions to threaded earrings that dangle embossed chips. Found quartz from Central Park is hand-cut and paired with metal map charms in refined arrangements. Dual-faced disc earrings are printed with a compass rose design and street map sections, with one flipped so that both images are represented forward and back. 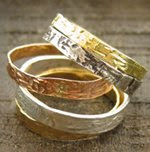 We especially adore the stackable rings (shown above), textured with street maps and available in a variety of metals from 18k green gold to oxidized sterling silver. To browse styles and purchase, visit the BYLU (pronounced BLUE) Web site. One wouldn't have to twist your arm twice for you to spill the beans and fess up to being a die-hard romantic. Yes, you're an old school glamour gal, addicted to sentimental movies and the occasional bodice-ripping novel. And in the corner of your mind, you fancy yourself a modern day Garbo, veiled in mystery with beauty to spare. Slipped into a fluttering silk blouse and dripping with Winifred Grace jewelry, you're armed and ready to navigate the town in vintage style. Lovely everyday pieces have always been designer Winifred Grace Gundeck’s specialty, but her Autumn 2008 collection proves that she can equally guide women through the evening hours as well. The 1920s-inspired selections, with looped rhinestone fringe and oxidize chain, have a magical antique quality, much like treasures found in an ancestor’s jewelry box. The flowing necklaces and elongated earrings may be perfectly in step with this season’s clothes, but thankfully they are not costumey, ensuring that the adornments can be worn for years and years to come. To browse styles and purchase, visit the designer’s Web site. If only life's biggest decisions were as black and white as a mathematical equation, with no shades of grey caught in between, and no ideological questions to ponder. Then, it might be possible, just possible, for all of us to reside on the same page, working happily in sync to accomplish greater goals for the common good. Sadly right answers are generally subjective, which forges otherwise smooth processes critically out-of-whack. But what if the solutions actually existed in the chaos? Twists and turns, after all, only remind us that nothing worth having comes so easily. Similar to the transformation of a sheet of paper from a flat piece to a crumpled ball, Cheung Lik squeezes once harmonious chain links into erratic 3-D silhouettes. 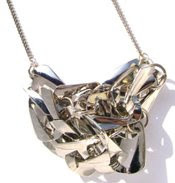 Some of the irregular shapes, presented in necklace and bracelet arrangements, have lopsided effects, others are more balanced, but all make a statement. Lik, who previously created amazing jewelry with the Daydream Nation team, has launched her own label, wear-and-tear, to showcase these pieces, along with her signature weaved fabric tape designs. To browse styles and purchase, visit the designer's Web site.